Yesterday’s signals were not triggered, as no key levels were reached. 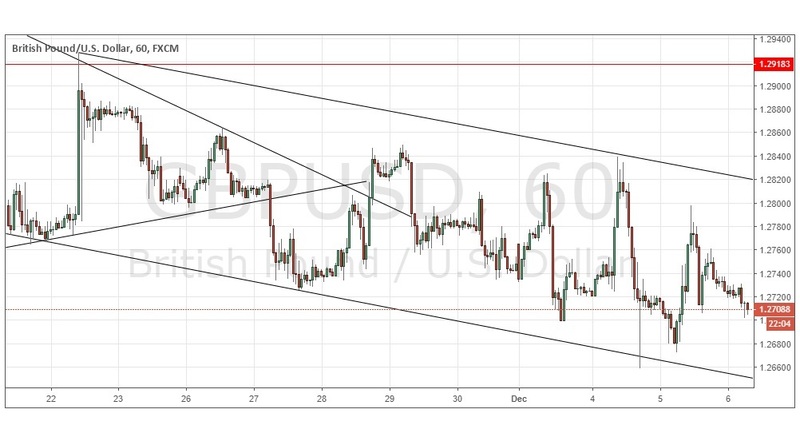 Go short following a bearish price action reversal on the H1 time frame immediately upon the next touch of the upper channel trend line shown in the price chart below which currently sits at about 1.2820. Go long following a bullish price action reversal on the H1 time frame immediately upon the next touch of 1.2616. I wrote yesterday that the Pound looked weak as the British government suffered some Parliamentary defeats yesterday which suggested they were at serious risk of losing control of the Brexit process. I remained bearish on this pair and would take a bearish bias at a strong break below the price channel shown in the chart below, or at a clear bearish reversal at the upper channel trend line. Neither of these scenarios played out, but the picture is even a little more bearish today and the price has fallen after spiking up and is now trading lower than it was 24 hours ago. I take exactly the same approach as I did yesterday. There is nothing important due today concerning the GBP. Regarding the USD, there will be a release of ISM Non-Manufacturing PMI data at 3pm London time.